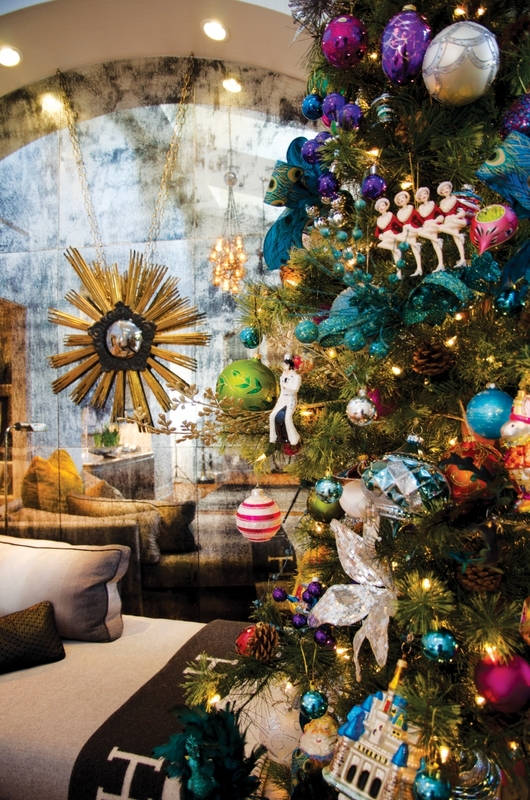 Boutique owner Holly Walton doesn’t miss a step in the world of high fashion, and she applies that same discerning eye to decking the halls. ABOVE RIGHT A close-up of Holly’s Christopher Radko ornaments, including a glimmering version of the New York City Rockettes in honor of the time Holly spends shopping in New York for her clients and boutique shelves. After they made the purchase, the Waltons created a neutral palette and brought in modern furniture with clean lines. “Everything I have is square and black and white, ” Holly jokes. “I’m very masculine in my taste, ” she says of her tailored, clean aesthetic. Much like at the store, Holly was hands-on in decorating her home, but enlisted a talented local team to help put the pieces in place. She brought in Tricia Willis who helped with the design work of some of the home’s unique features, such as the custom kitchen backsplash, living room mantel and Fromental hand-painted wallpaper behind the entertainment center in the family room. Willis also custom designed a floating console in the dining room inspired by a vintage piece that, sadly, wasn’t the correct size. “Tricia has awesome attention to detail, ” Holly says. ABOVE Stylish like her Momma, 9-year-old Camille wears a dress Holly purchased while traveling for market in New York. Working with clothing day in and day out, Holly has a keen eye for a good textile. She appreciates the way it feels, how it falls and what it is made of. She called on Katie Kirby of Detail Designs to help source fabrics for pillows that enhanced each room. She also sourced many fabrics from local retailer Cotton Capers. “Ann at Cotton Capers has an eye for just what I will be drawn to and calls me when she gets new fabric books in the store, ” Holly says. While the style is modern and minimalist, the home is full of vintage pieces as well. “My parents (Wilson & Sheryl Smith) tease me that they can’t get out of our chairs or furniture.” The low slung, vintage pieces Holly has incorporated into her decor might not suit the parents, but they pack a major style punch. Chris adds that their place also has a touch of Southern charm. Christmas decorating at the Walton home starts the day after Thanksgiving. “I am most looking forward to watching my daughter, Camille, get excited about the upcoming holidays. She makes everything much more fun and gives me a reason to decorate.” The little girl’s favorite part of the holiday season is decorating her own 8-foot-tall pink tree. The family makes an annual trip to Robert Moore where she selects new ornaments. Her grandmothers also present her with new additions for the tree each year. “She has everything from the Rockettes to Disney princesses to now emojis, ” Holly says. “The top of her tree is Glenda the Good Witch from the Wizard of Oz, which we purchased a couple of years back on our annual trip to Robert Moore.” She hopes Camille remembers these times as she grows older and is one day in a home of her own. Holly hosted both a debutante party and the Premier Medical office Christmas party at her home last season, so the holiday sparkle was in full effect. “When entertaining I have a few tall vases I use often, and my go-to flowers are white lilies. I love their aroma as it drifts through the house. But for special occasions, Elizabeth’s never disappoints. 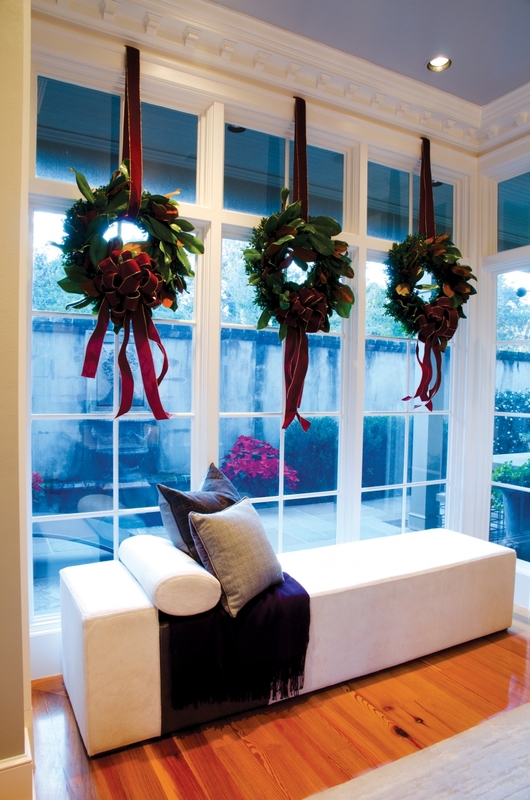 I am drawn to more architectural arrangements and for these parties, Elizabeth’s brought in deep red amaryllis and sculptural magnolia garlands.” The look, like Holly’s decor, was sleek and sophisticated. ABOVE The Waltons’ living room features clean-lined decor with a few touches of ‘60s-era glam. The family’s art collection came from Callan Contemporary in New Orleans. 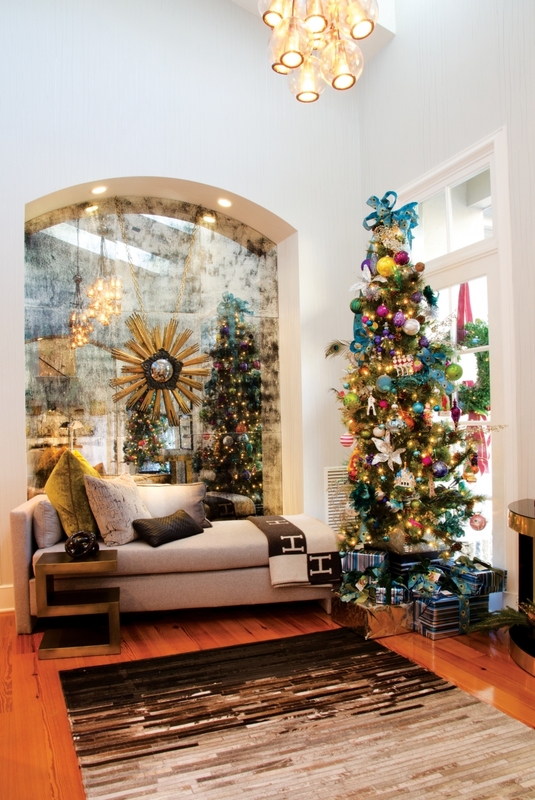 “Chris and I developed a wonderful relationship with Callan Contemporary, ” Holly says. 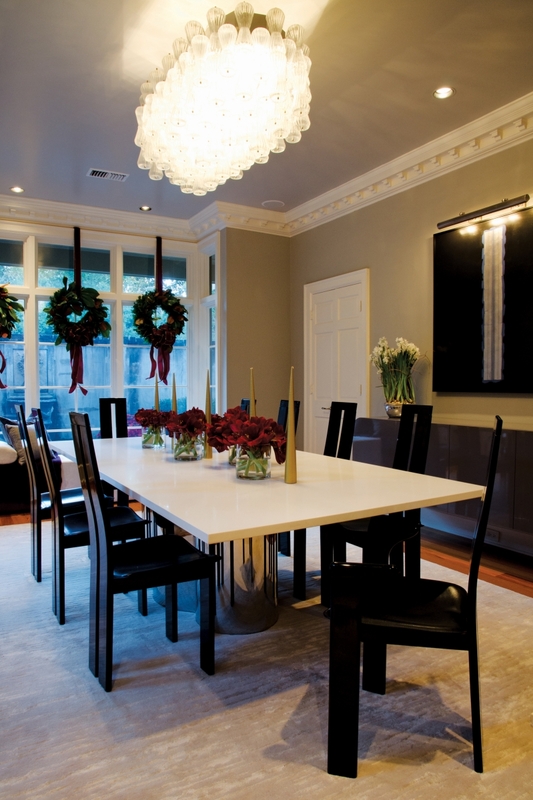 “The metal sculpture over the sideboard is by George Dunbar, whom we discovered through their gallery.” The holiday decor doesn’t overwhelm the home, but rather adds delicate and sophisticated touches here and there that are in keeping with the home’s overall style. ABOVE LEFT Star of Bethlehem flowers spring up out of silver vases, and a small gingerbread house that Camille made while at Ashland Place preschool adds a personal touch. 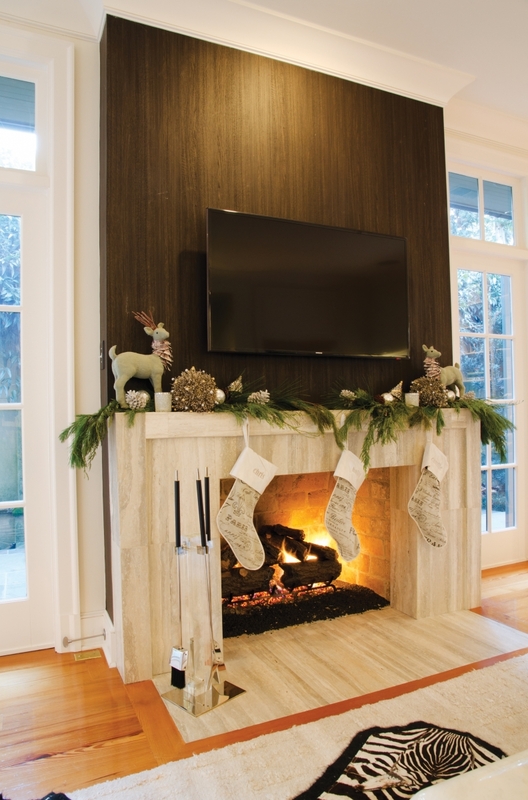 ABOVE RIGHT Tricia Willis designed the modern mantel out of blue limestone. The surround is, surprisingly, a Phillip Jeffries wallpaper she found to mimic dark mahogany wood that serves double duty by camouflaging the television. Holly added just a touch of greenery and metallic sparkle to the mantle. ABOVE LEFT Carol and Melissa from Elizabeth’s Garden did the flowers throughout the house for this holiday season. “I told them I wanted flowers the deepest color of Merlot, ” says Holly, referring to the amaryllis and deep red ribbons. 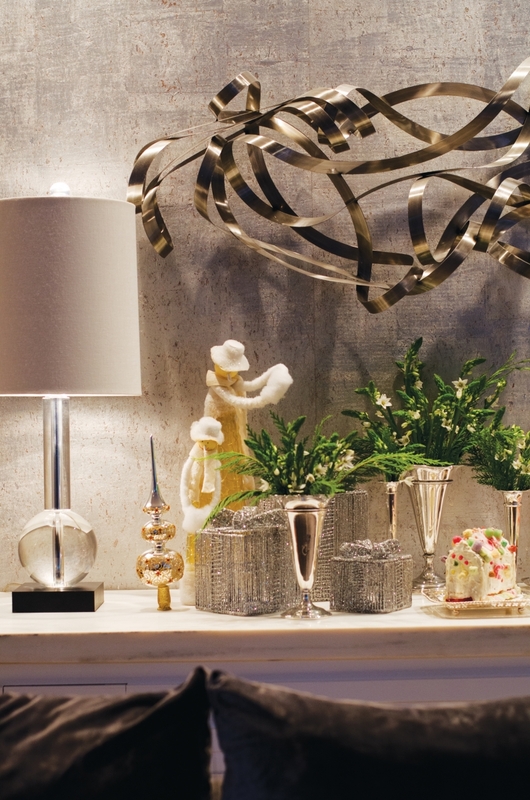 ABOVE RIGHT A Caesarstone tabletop in the color white cloud rests atop a base designed by Refine Limited that Holly purchased from 1st Dibs online store. The chairs are vintage Pietro Constantini, also from 1st Dibs. Holly scored deep burgundy ribbon at Al’s 5 & 10 that coordinates perfectly with the fresh blooms, and the color adds a little pop on natural greenery. 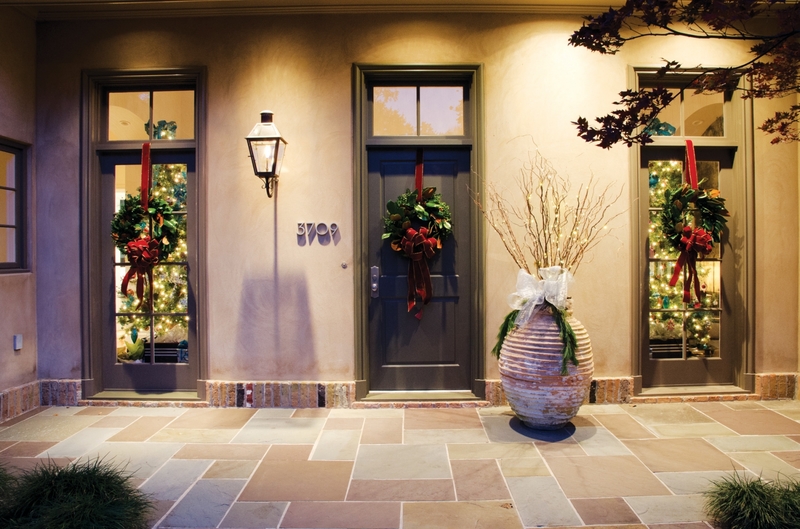 ABOVE Sleek lines and neutral tones begin at the entrance of the Waltons’ Spring Hill home.